Forklift spare parts might seem like dime-a-dozen commodities that can be purchased without paying much attention. But smart operations understand that the parts make up the whole, and the best way to maximize the value of your Toyota Forklift is to replace its parts with the originals – Toyota Genuine Parts. You might pay more up front, but the long-term value of Toyota Genuine Parts comes from their quality, durability, and reliability. What do we mean by quality? You bought your Toyota forklift for a reason. You know the brand and you know Toyota’s reputation for performance. Toyota Genuine Parts are made with the exact same care, quality materials, and attention to detail as the forklifts are. Our forklifts are made with Toyota Genuine Parts. What do we mean by durability and reliability? With Toyota Genuine Parts, you won’t have to worry about whether or not your forklift is going to work as hard as you do. Toyota Genuine Parts help increase your overall uptime and help keep you running longer; they’re manufactured to work and last. Toyota Genuine Parts are covered for two years or 4,000 hours from the date of purchase or installation. In those two years or 4,000 hours, Toyota will provide a replacement part or repair any Toyota replacement part that is defective under normal use and maintenance. Most importantly, Toyota will not charge for any warranty repair or warranty replacement work done at an authorized Toyota dealer in the U.S. during that time. In addition, labor will not be charged on a warranty repair/replacement if the work is performed by a Toyota Certified Technician! At Toyota, we know our parts are quality, so we will always back them up in writing. Do the others do that? Toyota Certified Technicians go through a rigorous training process that includes hours of both classroom and field-supervised training. Our trainers are top-notch, and they won’t let a tech come work on your Toyota forklift until they can assure the highest quality work. And what do Toyota Certified Technicians use during this intensive training process? Toyota Genuine Parts. These are the foundation of the Toyota Certified Technicians’ education. They know them inside and out, just like they know every inch of your forklift model. 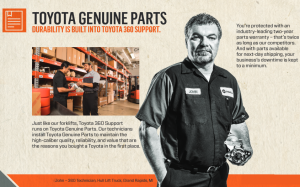 When Toyota Technicians use the best forklift spare parts, you’ll get the best possible work. And that leads to more uptime. That leads to more success and reinvestment in your business. Uptime is what we, in the material handling industry, all strive for. When we’re in uptime, we’re firing on all cylinders and getting more work done. We’re sure you can appreciate the same. So, what’s the best way to keep your fleet running? That’s easy. Dependable, long-lasting parts. Toyota Genuine Parts. Toyota Genuine Parts are manufactured and engineered to work seamlessly with other parts in your Toyota forklift. When a Toyota Genuine Part is your replacement part, you are upgrading your equipment and increasing your uptime. Aside from the obvious, why is uptime so important? Customers like it. When a customer orders something, whatever it is, they usually want it quickly. Uptime means no delays because of the supply chain and quick order fulfillment. You save your reputation. Today’s customers don’t just like things to be completed quickly, they demand it. The last thing you want is to gain a reputation of always having down equipment and therefore delivering things slowly. You’re making good use of your money. The last thing you want is to be paying employees to be sitting around because the tools they need to complete their job are down. When you are in uptime, your employees are able to do what you’re paying them to do. Your productivity is increased. It’s amazing how much you can get done when you’re not sitting around waiting for something like your forklift to be repaired. You can be innovative. If you’re constantly waiting on down equipment, you’ll barely have time to do the necessities, let alone be innovative. With more uptime, you’ll get the essentials done quicker and therefore, have more time for innovation and improvement. Even when you have a mixed fleet, Toyota is your one-stop-shop with our STARLIFT program. Complementing Toyota Genuine Parts, STARLIFT is a parts program that makes forks, tires, oils/chemicals, batteries and other replacement parts available for Toyota forklift mixed-fleet customers. The forks that come standard on your Toyota forklift are the same forks the STARLIFT program offers. Toyota works with two fork manufacturers, Arrow and Cascade. Both are long-standing companies that focus solely on material handling products. The next time you need forks, make it easy on yourself and go to your one-stop-shop Toyota forklift dealer and ask about the STARLIFT Parts program. For more information about ordering Toyota Genuine Parts, request a quote or contact your locally authorized Toyota dealer. The original article was published by Toyota Material Handling U.S.A.